Life isn’t static, and your financial plan shouldn’t be either. Myriad scenarios can alter your economic future, and it is our job to ensure your financial management roadmap remains current amid varying circumstances. Exclusively available to our wealth management clients, Balentine Blueprint financial planning platform enables us to make informed recommendations by capturing and streamlining your financial portfolio. We leverage our decades of experience along with leading planning and quantitative risk assessment software in order to design strategic plans that monitor your progress and, ultimately, to achieve your personal goals. Start simplifying with Balentine Blueprint. Our interactive planning experience allows you to visualize the effects of changes in assumptions. 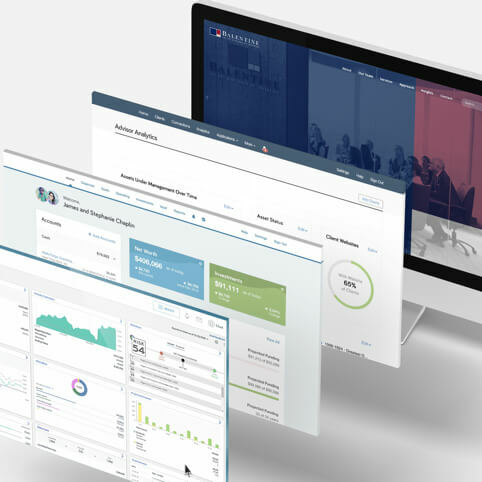 Gain visibility into your full financial world on one screen. Keep life’s important documents secure yet easily accessible. Monitor your progress to plan wherever life takes you. Our financial planning process begins with an understanding of where you are today and where you would like to be in the future. We help you quantify your aspirations, evaluate various paths for achieving these goals, and develop a blueprint of financial decisions to maximize the likelihood of success. By putting in the effort at the outset to understand your world, we are ready to address new situations and opportunities as they arise. All financial plans involve choices. Visually experiencing the effect of a change allows our clients to better understand their options. How does selling your company at a multiple of 12 instead of 8 impact your future? What’s an appropriate amount to take out of your business and invest conservatively to provide some peace of mind? While it is impossible to predict the future, we can help you gain a better comprehension of the potential impact of various events, whether they be related to your business or personal financial goals.